Riding a motorcycle amongst a group of others, be them friends or relative strangers has many positive aspects to it, not just socially but also with regards to staying safe & looking after the rest of the bunch. When riding within a group as part of a ride within a group then it is usual to have some form of plan or preparation, be this a predetermined route or a friend who can act as leader to direct others, usually the most experienced rider or one with some form of advanced skill. The simple aspect of planning of a route and having some basic riding roles is then distributed to the riders within the group so that everyone knows at least what to expect and where they need to go is certainly going to make sure the group rides a lot safer & without complications. There are 2 commonly suggested methods for group riding which i’ve highlighted below. Essentially the marker system has a lead rider and a rider that stays at the rear with riders alternating positions along the way. A lead rider usually heads the pack to determine the route or maintain responsibility. The second rider takes his direction from following the lead rider, pulls over to the side of the road and directs the other riders in which direction the lead rider has taken or helps keep them all together. The second rider then re joins the rear or (just in front of the rear rider if you prefer to adopt a fixed rear rider). The next rider in the pack then takes up the role of the second rider and follows suit and so on with other rider progressing along the line in turn so everyone has to do lead or second rider duties. The second rider may also need to ride in front of the lead rider to change the lead rider or alert the leader to slow the pace down or stop somewhere if the group becomes broken up or fragmented. 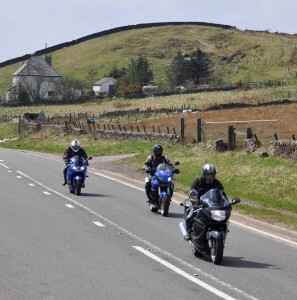 The checkpoint system is one where each rider knows the route and/or the location of the final destination and rides as a group but always as an individual and follows the route and make regular stops using meeting points at landmarks or checkpoints along the route to stop at along the way to ensure everyone is still safe & no mechanical difficulties are causing problems or fatigue setting in are occuring with one or more of the group etc until you reach the final destination. This will require some kind of planning, pre ride briefing and monitoring along the route, with each rider being aware of their role & where the stops are likely to be. You could also designate a rider as a leader or other to take on the role of a Marshal to keep the group prepared to act & retrace their route should anything happen such as someone gets lost or the group breaks up. In many instances, especially when there has not been any such system adopted, there is a tendency for the riding group to get disconnected and this leads to riders either using excessive speed in order to ‘catch up’ the other riders, or riders focussing their attention only on the rider in front and not on the road and other vehicles further ahead. Another common issue with group riding, especially with larger groups in higher density traffic areas, is that the ‘tail riders’ may get caught up behind traffic and result in riding at slower than normal speeds. This may lead to frustration, which then may lead to mistakes being made or excessive speeds trying to catch up a lead group again. There is no golden rule to the optimum number of riders that should be within each group, however it should be manageable by all parties. This would largely depend on the group riding experience of the individual riders within the group. General advice would be; if you have inexperienced group riders within the group, then keep the group quite small, certainly below 8 – 10 riders. When there are a lot of you together, if necessary split into smaller groups or individual packs of half a dozen, if there is a lot of you riding each pack having a pack leader with 4 or 5 others in each pack can help organisationally. One very important thing to remember is that each individual rider is and should be responsible for their own actions and safety. Route: Roads, Destination & traffic difficulties such as road works or congestion. Alternative Routes in case any rider wishes to break off early. Credit card or some cash.. just in case you’ve forgotten one of the above. Also have contingencies for road side recovery such as one of your group having access to a van or trailer that can carry a bike or knowing someone who can be on hand to help at home if required to come to the rescue. Failing that a credit card or sufficient money in case you need to pay for repairs or recovery.